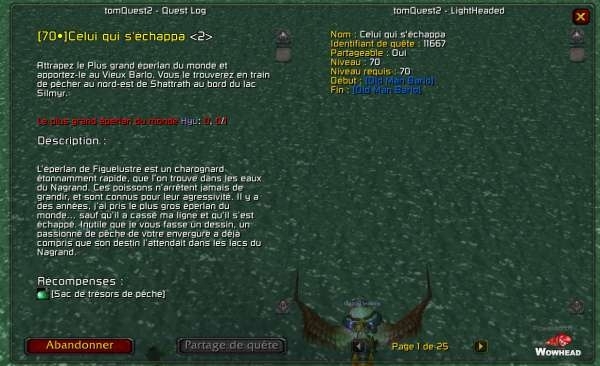 TomQuest2 is a quest addon that is made for LibDataBroker (ldb) here is a list of addon using ldb. Movable quest tracker with same features as the quest tooltip. 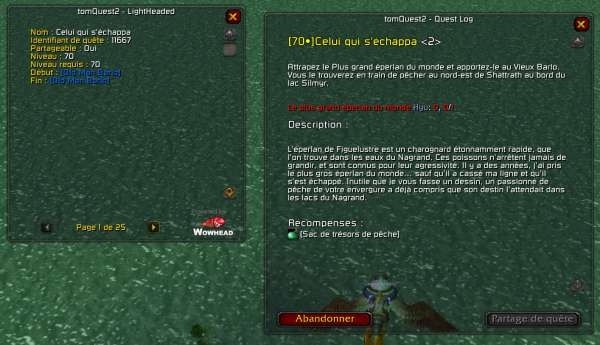 Show / hide quest tracker when shift-clicking the questsTooltip ldb plugin. Show / hide achievement tracker when alt-clicking the questsTooltip ldb plugin. If you find some mistake in my English or French locale you can send me a pm for modification. If you find a ticket for the same error you can give more detail if you have. Fix quest log text description faded when quest auto accept is turned on. Warning! You'll certainly have to enable those ldb objects. fix a few bugs in Config & core and trackers. display quest tooltip in quest tracker for party quests. 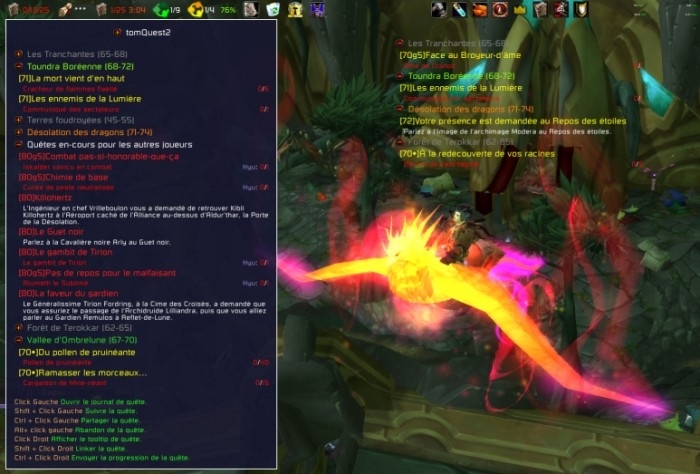 fix problem of messed trackers when updating in combat ==> use WatchFrameItemButtonTemplate instead of secure item template so only quest items given by wow API are clickable. Option to add a few pixels to the rightmost cell of the tooltip/trackers to avoid cell clipping. This is by far my favorite quest tracker, if someone could either 1 update or to take it over I for 1 and I'm sure many others would be extremely grateful. Any alternative suggestions for this addon, gosh all the one's I've tried so far don't hold a candle to this. Please consider updating or finding some else who will! <string>:"safecall Dispatcher":13: in function "?" I have a small but useful feature request. Is it possible to have a popup on screen when you auto-complete a quest? The Blizzard one doesn't show up and I have to open my quest log to complete the quest. If there is a way to do it, I couldn't find it in the options. I've a minor issue to report. If I click on a quest into the Quest Tracker nothing happens but I have the mouse click bound to "Open Quest Log". Maybe I've overlooked it in the setting but how can I move it to the left side of the screen instead of on the right? 5.0 Release 2 is available, can you tell me if your problems are now fixed? Last edited by And : 09-20-12 at 06:25 AM. Thank you very much for the update but I get some problems. - Tracker doesn't correctly track quest, it only shows one or twos quest for me but most of my tracked ones are not there. It doesn't automatically track dailies whn I accept them. - The quest tooltip in my broker display doesn't count the dailies and sometime it simply doesn't show anything, only the icons. I receive no errors, it looks like some features are not working correctly. TomQuest2 is no longer displaying in Titan Panel. Titan Panel isn't even "seeing" it as a lib broker mod. I've just uploaded 5.0 release 1. If you find any problem please report here or on wowace tracker, I'll try to fix it ASAP.